A colour digital photograph of the Flaherty Dow Elliott & McCarthy Litigation Counsel Office in Whitby, Ontario. 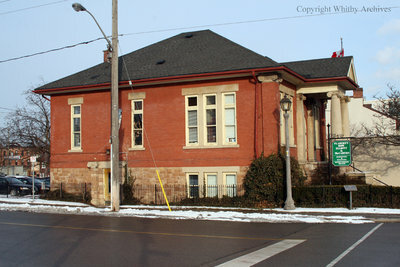 View is of the side of the building taken from the corner of Bryon and Dundas Streets. Carnegie Library, January 2014, Megan Pugh. Whitby Archives D2014_001_001.